Bath House Soaps are treasures of handcrafted designs. Every handmade bar is a generous 5.5 - 6 ounces, unique and affordable. 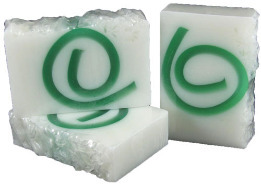 You owe it to yourself to soothe and moisturize your skin with the rich lather of glycerin soap. Whether your eye catches the beauty of the soap first, or your nose says "Ooooh, whats that wonderful smell"? You will be happy to have a bar of soap that is a ... "Dessert for the Senses"
Gift certificates in any amount you like A classic fragrance that has stood the test of time. Exhilarating! Summer flowers and orange. Just the right blend of tang and sweet. Compare to Victoria's Secret. Strong, Warm and Mysterious A Best Seller! It's a coffee house treat! Copyright © Bath House Soaps. All Rights Reserved.